I try to catch #genchat on Twitter when I can. This past Friday(Dec 30) was a #genchat night and the topic was non-population schedules. I haven't really worked with those a great deal so I went looking thru some of them today. I found my 3rd Great Grandfather Thomas Adcock in the 1860 Agricultural Schedule for Dekalb County Tennessee.It really does give you some idea of your ancestors position in the community and what life must have been like for them. As expected my Thomas didn't have much. Thomas Adcock's entry recorded: 3 improved acres, 30 unimproved acres, His farm value was listed as $300. The value of his farm tools and machinery was listed at $10. He didn't own any horses but had 1 milch cow and 3 other cows, 9 sheep and 9 pigs. The total value of his livestock was listed at $100. He did have 1000 bushels of Indian corn though and 12 lbs of wool. Other items were 2 bushels of peas or beans, 10 bushels of Irish Potatoes and 200 lbs of butter.Thomas was already poor before the Civil War. The information from the Federal Population census for the same year shows that he was 43 years old with his wife and 6 of their children still living at home. I hope they had some chickens. Thomas would enlist in the Confederate Army's 1st Infantry Battalion Tennessee Company C. He was captured and taken to Camp Morton Indiana. More information can be found in his Confederate Pension Application and at my webpage which lists his answers from his application and also some of the other applications from that area including his Widow's Confederate Pension Application. I have listed the headings for the columns of the 1860 Agriculture census schedule below to give you some idea of what information was gathered. It is kind of hard to tell from the record itself so I had to get some of the headings by looking thru a few pages and finding the least blurred. "Tennessee Probate Court Books, 1795-1927," images, FamilySearch (https://familysearch.org/ark:/61903/3:2:77TV-BV3R?cc=1909088&wc=M6Q7-YNG%3A179838801%2C180033501 : 22 May 2014), Warren > image 112 of 488; county courthouses, Tennessee. The following is the text from the first page of the project containing the information about what was included, how the project is identified and those involved with the project. Inventories, Sale Bills, Statements, etc. So I went in search of the microfilm of the book from which the WPA made the transcription. "Tennessee Probate Court Books, 1795-1927," images, FamilySearch (https://familysearch.org/ark:/61903/3:1:S7WF-SJQC-S9?cc=1909088&wc=M6QW-MMS%3A179838801%2C180050501 : 22 May 2014), Warren > image 74 of 328; county courthouses, Tennessee. Not a lot of difference Indexed as Brazell Riddle pg 96 by the WPA project I was unsuccessful searching for him in the two indexes that were in the book. I have two questions. Were there 3 items(Horse, bridle, and saddle) for sale or 2(Horse bridle, and saddle). I know nothing about horses horseback riding or their value today or in that time period. $31 seems rather low. Also I'd like to know who are the 5 heirs? Bazil is indexed as Bogle Riddle in the 1805 Roane Co. Tennessee Tax list. Milly Riddle would marry in Roane Co. TN on March 11th 1806 to George Hitchcock. On the 1836 tax list and 1840 Federal Census, there is a Britton Riddle living in Warren County. Could he be kin to Bazil or Milly? Wife of Mason Combs Jr. I've found it useful to send share links to some of my closer matches so they can see who matches my test. The top question after I do that has always been "How did you do that?" I thought it might be useful to post about the process and include some other information from that page as well. Hope that anyone wanting to know how to do this or explain it to others will find this helpful. In order to send a share link you need to be viewing the DNA Insight page for the kit which you want to share. It should look something like the above image across the top. You will want to click on the button with the Gear logo and the word Settings. That will take you to a page which has several different options: Email Settings, Privacy, Family Tree Linking, Research Content, Sharing DNA results and Sharing Ethnicity Results. Below I have two images showing how how the page should look at the top and as you scroll down to the section where you can send invites to view your DNA results. I did edit out the names of people that have a share link TO my DNA results in the example. If you had sent DNA share invites prior to this there would be a listing of users that were allowed to view your results as well as their permissions/role and the REMOVE buttons which you could use to "unshare" at any time. Once you click on the Invite Others to Access DNA Results you will have a window pop up which looks like this. From here you can add emails or usernames of people whom you want to have access to the DNA test. Choose Roles for that person(typically Guest unless you want them to be able to change trees to which your DNA is linked.) Click on Send Invitation and you should get a notification when they accept your share link. 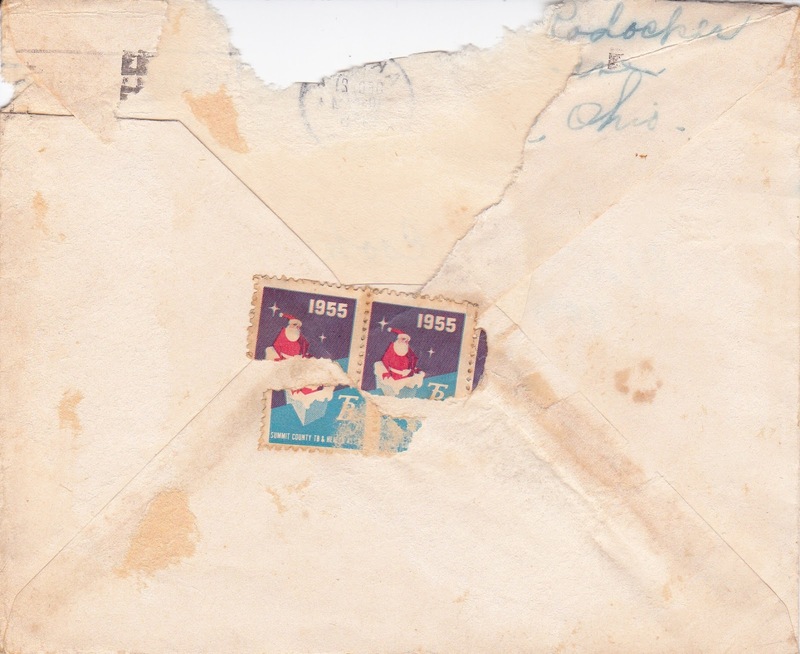 I believe this is the envelope in which the Christmas card that Flora sent to my Grandmother was mailed. I laid the card on the envelope and it is the perfect size for the card. That combined with the Postmarked date & place and the partial name and address of the sender on the back are certainly making it look like that is the case The handwriting on the envelope also matches that in the card. Sure it could be from one sent at a different time but given the details mentioned in the letter inside of the card I have very little doubt. So how close did I come using the directories to find the likely time that the letter could have been sent? I said "some time in the period from the publication of the 1954 and the 1956. Compare that to what the post mark says Dec 21st 1955 at 10:30am. 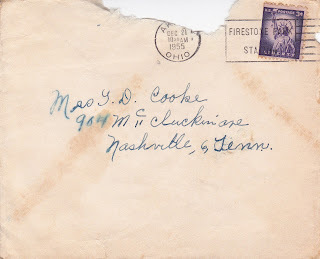 About 10 years back I had looked at all the crumbling envelopes in my Grandmother's collection and noted the postmark and address(the when and where) of where she was.living. She had lived at many different rental homes in East Nashville after they moved from Old Hickory Tennessee. This address is one that was not on any other envelope I had found. So now I knew WHEN the letter was sent. Still gathering more clues on how she might have known my Grandmother. 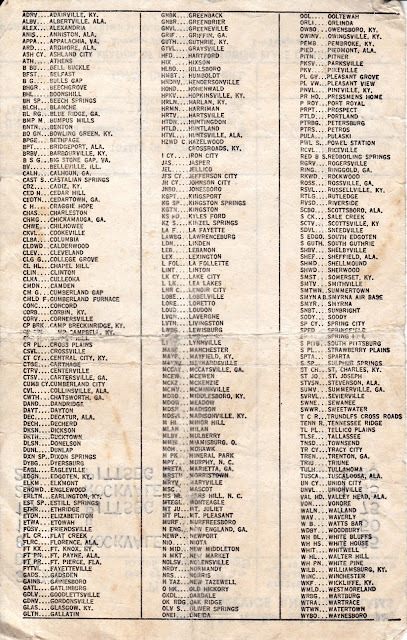 Alphabetical List of Names Example: From the Smith entries of the Akron 1968-69 Directory. Full Directories listings for Akron OH can be found at the Akron Summit library's website on the Historic City Directories page. An added bonus is that you can use all this information to find other information. For example you might look up someone's place of employment in the Business Directory section after viewing their Name Entry which lists where they worked. In some directories companies will list employees. Of particular importance to me are the years after 1940. I'd like to fill in some blanks on my family during that time period. 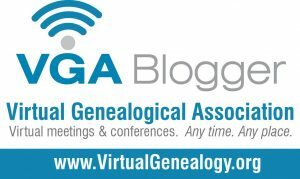 Find out if there are directories covering the area where your ancestors lived. What year was the letter written? Flora's daughter was married to her first husband in 1943. The daughter would have been divorced some time prior to 1956 as that is when her ex husband marries again. This leads me to believe that the letter was written some time between 1943-1956. I searched for a source for divorce records for area of Akron, Summit Co Ohio, USA but didn't find one available on-line. So I did what I would have done if I were "on the ground" in that area. I went to their library by way of the website. As it happens the Akron-Summit Co. Library has done a wonderful job of getting many of the City Directories on-line. One of the most impressive ones I have seen. I now totally get the importance of City Directories and how they contain a vast amount of information. 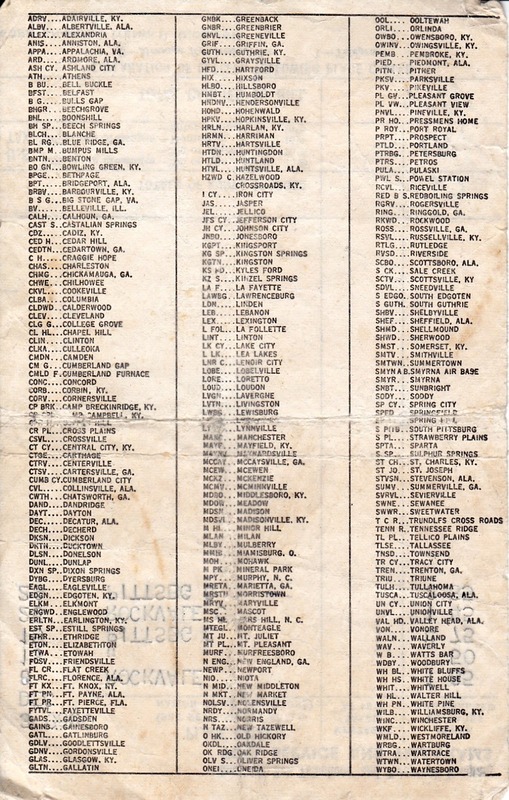 By checking the Directories for the years from 1940 to 1956 I was able to get an idea of the time period in which it was written. The 1956-57 Directory shows Flora's Son-In-Law and her Daughter living apart from each other. They were together in the 1954-1955 listing so I think it's safe to say that the letter was written some time in the period from the publication of the 1954 and the 1956. Flora's son-in-law marries again in June of 1956 so it may be closer to 1954 when they separated and divorced. Where is their oldest son in 1940 was he already in the Navy? If so he should be enumerated at the location which he is stationed. 326. Soldiers, Sailors, and Marines.-Enumerate soldiers, sailors, and marines in the Army or Navy of the United States as residents of the place where they usually sleep in the area where they are stationed. If, therefore, any household in your district reports that one of its members is a soldier, sailor, or marine stationed elsewhere, do not report him as a member of that household. I'm continuing to search for the oldest son in the 1940 Census. I was able to request a copy of his obit and found that he was living with his sister in 1974 when he passed away. Oddly it didn't mention the younger brother who I had found through public records and marriage records living in Dade Co FL. He would pass 6 years after his brother's passing. As I was searching the directory I also came across some of my Dad's paternal cousins who had moved north from Tennessee to Akron Ohio for work. Because they had lived in Indiana a good bit of time when I knew them, I'd forgotten about their Akron Ohio connection. So I've sent a message to see if any of them know who Flora might be and her connection. At this point I still kind of think the connection is a chance meeting when my Grandmother went to see her son who was at the naval hospital in the Washington DC area. Add to this too that I also noticed that Flora's Social Security Application was completed in Washington DC. The years 1952-1954 are listed in parenthesis in the place where the application year is usually located. These years differ from the time period that my Grandmother would have been there. I wonder if the older son was living in Washington from 1940-1954. 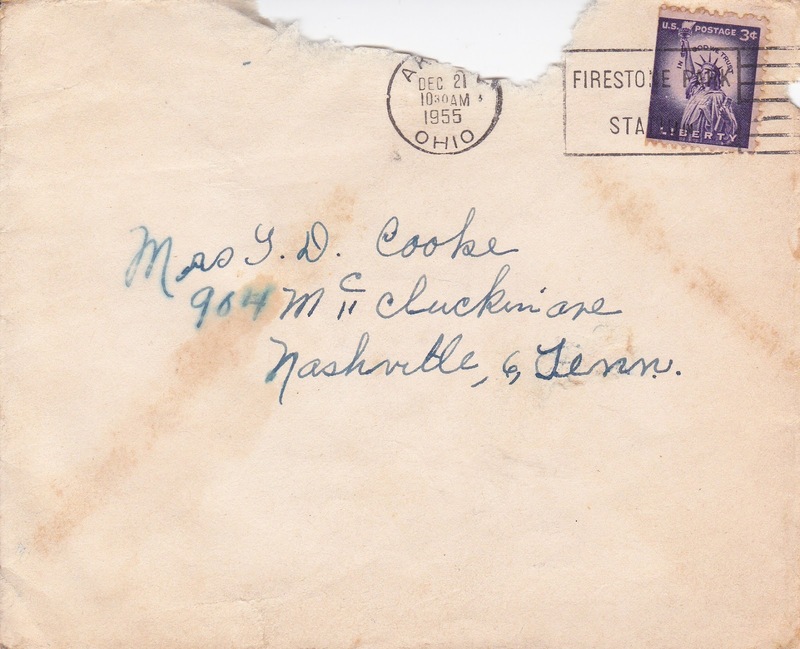 By the time she wrote the letter in the card he would have been in the hospital in Chillicothe Ohio. Much more information and research is needed. A lot of clues but no clear answers yet. I've been working on a FAN research project today which led me to seek out records from the Akron-Summit County Ohio area. Let me just say how wonderful it is to see a Special Collections department that has so much on-line for those interested in the local history. The Akron-Summit County Library has a wonderful Database section. The range of dates which are covered by the City Directories they have available on-line is so very impressive and was so helpful in my search for information from the 1940s & 1950s. They also have an obituary index from which you can order copies. Digital(free) or copies by mail. I only wish I had ancestors from that area. As the holidays approached I found myself as I do every year looking through my wrapping paper, gift bags & cards and trying to determine what I need to buy more of in order to get thru the current season. Inevitably, I also find the box which contains cards I have received over the years as well as some older cards that people sent to my paternal Grandmother. One from her sister, Kitty Jakes Bell, another from Cora Jakes Gibson(another of her sisters)...one from her niece Olive Bell Shriver and her husband Sam. One of the cards was from someone I couldn't place in her family and I thought it might be a neighbor or someone she has rented a house from as they lived in East Nashville rentals a bunch after moving from Old Hickory and before she moved to Dickson. I looked inside to get the name which I believe I had done before and just figured that the card was from family. In addition to the name I also noticed faded ink across the entire card. 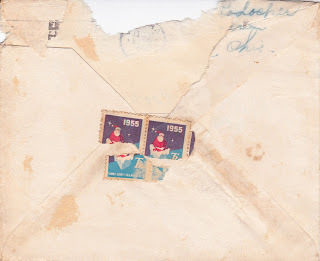 At first it looked like a letter had been in the card and faded, but on further examination I can see that the sender, a lady I'll call Flora had written a letter on the folded inside of the card. The letter told of some hardships she and her family were going thru and made me further curious about how they knew each other. My curiosity was peaked even further when she asked about my Uncle Morris and sent her regards. Flora and her husband live in Akron Ohio on Austin Avenue. She gave vague details of the health problems she and her husband had been facing. Flora's son was in the hospital in Chillicothe (OH?) and apparently it isn't a minor hospital stay as she mentioned not having written to him in awhile. This leads me to believe that it may have been a Veteran's hospital so I want to check the census records for this family and see what I can find. Flora's daughter is also having a hard time. Her husband has left her and her children(Flora's Grandchildren) at the holidays. What little information I do know is pulling at my heartstrings and I want to know how it turned out for these people....and yes...how they know my grandmother. I note all of the clues to her identity in the letter so that I can use it in my research. 1940 Akron Ohio but not at the address on the card. Flora was born about 1902 which puts her at about 11 years younger than my grandmother. All are Born in Ohio and there parents were also according to this census. Flora was 15 when she married and her husband 21. I want to look for a divorce record for the daughter. That will give me an idea of what time period the letter was written which will tell me how far back their friendship goes. I wonder if Ohio has the divorce court records and rulings at Ancestry like Michigan does. from telephone service in Old Hickory Tennessee, or the Nashville area. 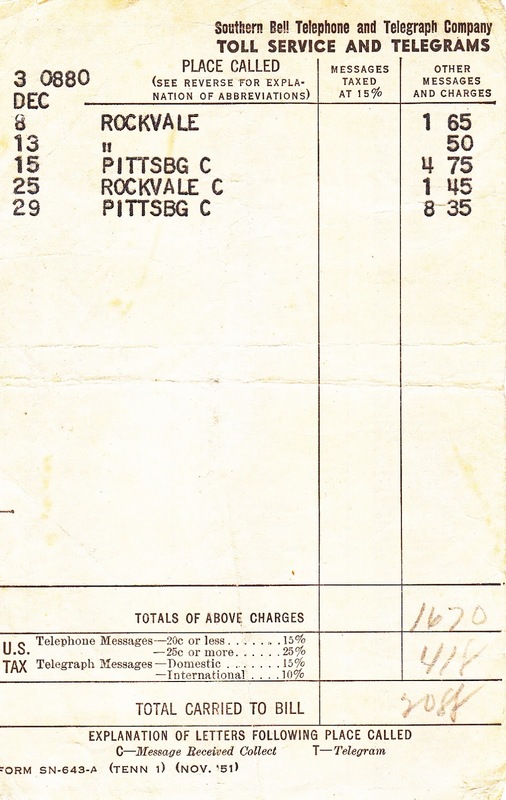 The above image is a snippet from the inventory of the Estate of Robert Boyd. Robert's will was written in 1837(Oct 26th) in Warren Co Tennessee. Van Buren Co TN was formed from part of Warren Co TN along with parts of White County & Bledsoe County. The act to form Van Buren county passed on January 3rd 1840 but according to the information in the act at the TN.gov site, it appears records didn't start until April 1840. It looks at though Robert Boyd's probate records were caught in the middle of the formation of Van Buren Co. TN. A note from Will Armstrong, Warren County Clerk states that it(the will in the Van Buren Co Record Book) is a true copy of the original will on file in his office. So although the probate records start in Warren Co TN...they end in Van Buren Co TN but do have a copy of all the will there. In the will Robert left pretty much everything to his wife Jane to use in the support of his "little daughter" Ann. He appointed William Logue and John Boyd as executors. The listing of inventory along with the sale starts May of 1840 and wraps up July the 8th of 1840. I should note that although Wm Logue is listed on the will as executor along with John Boyd I don't see any more listings of him as a witness or purchaser at the estate sale. This adds more weight to this being William Marrs Logue, Robert Boyd's Father-In-Law who is known to have passed before September 4th 1839(I need to do a blog post on his estate info.). Wm Marrs Logue was the maternal 1/2 brother of my 4th Great Grandfather, John Fleming. "Tennessee Probate Court Books, 1795-1927," images, FamilySearch (https://familysearch.org/ark:/61903/3:1:3QSQ-2RKT-G9?cc=1909088&wc=M6QQ-L38%3A179830201%2C179855401 : 22 May 2014), Van Buren > image 3 of 186; county courthouses, Tennessee.